Big companies are building up cash and are expected to report strong earnings starting this week. Not so for small businesses that can't get loans - or hire freely until they do. The gap helps explain why the economic rebound isn't stronger and could even stall. Federal Reserve Chairman Ben Bernanke stepped up pressure Monday on banks to break the logjam and lend more to smaller firms, which employ at least half of American workers. Small business owners are relying on personal credit cards or raiding retirement accounts to stay afloat, the Fed chairman said. Bernanke and other regulators have urged banks for months to lend more to smaller companies. Lawmakers have complained that small businesses that want loans are having trouble getting them. Banks have countered by saying demand remains weak. The Fed does have authority to create programs to increase lending, such as providing low-cost loans to banks. But economic conditions would probably have to weaken considerably before the Fed would propose such a move. One such program set up during the 2008 financial crisis was recently closed. The Fed chief's latest comments came as legislative efforts to spur small-business lending have languished, and as the recovery has lost momentum. Bernanke spoke at a Fed conference held to explore ways to loosen lending to small companies. "Making credit accessible to sound small businesses is crucial to our economic recovery," Bernanke said. "More must be done." Some small business leaders say they would hire more if only they had easier access to loans. One of them is Marilyn Landis of Basic Business Concepts Inc. of Pittsburgh, which compiles financial documents for other small businesses. Landis says she would like to hire one or two more people for her 10-person firm and wants to expand into New England. Yet even though she says she's never missed a payment, Landis says her line of credit was cut about 18 months ago. She relies on credit cards to pay for everything from supplies to payrolls. Without additional credit, she says, "It is impossible to expand, and I can't hire." Nearly one-third of small business borrowers report difficulty arranging credit, the National Federation of Independent Businesses says. By contrast, big businesses, which start reporting their second-quarter earnings this week, have enjoyed easier access to loans and low interest rates. Analysts expect companies in the Standard & Poor's 500 to report a 42 percent jump in profit by one measure, S&P says. For the current quarter, which ends Sept. 30, they expect a 31 percent rise. The big companies also benefit from something available to fairly few small businesses: plenty of cash. In March, cash at S&P 500 companies hit a record $837 billion - about a year and a half's worth of profits. And S&P senior analyst Howard Silverblatt says he expects cash to rise to a new record for the April-to-June quarter when figures are released later this summer. Yet even as the economy has improved, lending to small businesses has declined. It's dropped from around $710 billion in the second quarter 2008 to less than $670 billion in the first quarter of this year. The Fed and other regulators have urged banks to step up lending to creditworthy small businesses. Despite the push, such lending is still tight. The impact on the economy is severe because small businesses tend to drive job growth during recoveries. 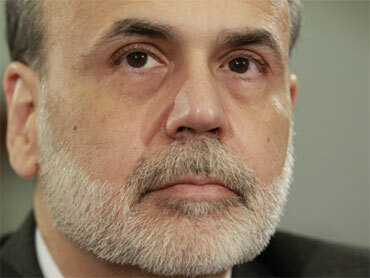 They employ roughly half of all Americans and account for about 60 percent of job creation, Bernanke said. And newer small businesses - those less than two years old - are especially vital. Over the past 20 years, these startups accounted for roughly a quarter of all job creation, even though they employed less than 10 percent of the work force, he added. The Obama administration in early May sent Congress a proposal to create a $30 billion program to unfreeze credit for small businesses. The fund would provide money to small and medium-sized banks to encourage them to lend to small businesses. The legislation has yet to pass the Senate. Bernanke said it's hard to tell whether the problem is banks refusing to lend to small businesses or a lack of demand from those companies. Each company faces different economic conditions and complex relationships with customers, suppliers and creditors, Bernanke said. Some lenders say they have restored more traditional standards after a period of lax lending that contributed to the financial crisis. Several big banks say they're already lending more to small businesses. Bank of America lent $19.4 billion to small and medium-sized businesses in the first three months of 2010, an increase of nearly $3 billion from last year. JPMorgan Chase and Citigroup have pledged to lend more, too. Combined, though, the dollar amounts are relatively tiny compared with how much banks would lend in a healthy economy, said Robert DeYoung, a finance professor at the University of Kansas. "These numbers would be dwarfed by the increase in lending after the economy starts recovering, and the economy hasn't really started to recover," DeYoung said. Banks will be able to increase lending significantly, DeYoung said, only after businesses feel confident enough to take on more debt. Prodding banks to lend before then raises the risk that they'll make bad loans, he said. "I wish I could conclude this wrap-up with a list of the three or four things we could do to immediately unlock small business lending," Fed Governor Elizabeth Duke said at the conference. "But the problems are numerous and complex, and they will require creativity and persistence to solve."